Wow, this has been a crazy summer, full of activities! 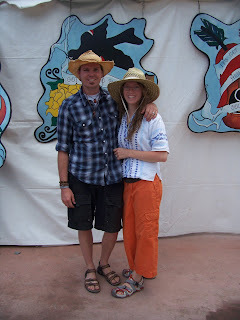 It felt like we were just settling back into the swing of things when it came time for one of our favorite traditions: going to a folk/music festival. 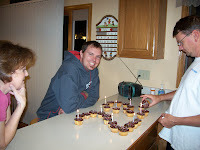 It was also a trip to celebrate Michael's 28th birthday, so it was extra special. 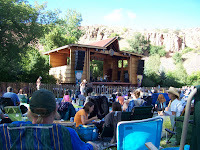 This year we decided to return to the place where we had our first-ever folk festival experience: The Rocky Mountain Folks Fest at Planet Bluegrass in Lyons, Colorado. The awesome thing about that festival is that we get to see/stay with either of our two sets of aunts and uncles that live only about 1hr from Lyons. The hard part is the long drive (not too long at only 7hrs or so), but we were sure glad not to be driving at 3AM like the first time we went out. The festival grounds are just beautiful on the Eastern side of the Rockies, and the stage is awesome. We got to see lots of great artists from Dougie MacLean (a cool Scottish singer) to Madeleine Peyroux (a sultry jazzy singer) to Gillian Welch (a true folk music artist). With 3 full days of music and eco-friendly people (they had recycling, composting, and the festival pays carbon credits or something for the carbon use to get each artist there), we were sure happy (but very tired afterward). It was nice and cool for most of the festival, with sunshine one minute and 20-30 minute micro bursts of rain the next. 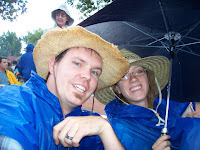 We only had one micro burst a day, but we were still glad for Rheid and Sherrie letting us borrow a tarp and two rain ponchos, they were lifesavers in keeping us and everything we brought dry. During the rain the festival would turn into a town of umbrellas, even the microphones had their own little ones. It sure has been a crazy cool summer this year! My aunt's tomatoes won't even turn red because of how cold and wet it has been. 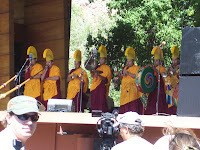 One of the coolest parts of the festival was the Drepung Monks' performance. They are Tibetan monks and have the most incredible philosophies and ceremonies. Their chants are multiphonic, meaning each person makes more than one tone as they "sing". However, it's nothing like a chord on a piano, and they don't intend to make more than one tone at a time, it just happens with the way they are trained to use their "full voice" I think. It was so neat to see them and learn more about their culture and heritage (even though it was sad with everything that's been happening to their people). We even got to attend a special meditation session led by the monks, it was really neat. 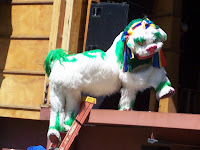 This is a photo of a special creature in Tibetan folklore. If I remember right (and I might not), I believe it is thought to appear when people and animals are in harmony with their environment, kind of symbolizing peace and happiness for every living thing. Michael says the creature is a snow lion or something like that. It was an awesome dance they did with this big puppet creature, in the photo they climbed a ladder up to the stage after dancing around the crowd. It danced similar to a dog at times and even scratched its head with its foot and rolled around on its back. At the end of the dance it carried a World Peace sign around in its mouth. Needless to say, all the children paid attention to this performance. Since the trip was for Michael's birthday, we naturally forgot it was his birthday the Saturday we were there until my aunt Sherrie reminded us - pretty silly. She was so amazing and made him birthday cupcakes (and I confess I even had a couple - I know but they were so tasty and Sherrie was so awesome I couldn't help myself). She arranged them in a 28, Michael's new age, and then we lit some candles and sang. All this at 10:30PM or so as the festival goes late. My relatives rock! We are planning to find another time we can go out and see just them, instead of just saying hi in the morning and goodnight at night like we did during the festival (sorry!). We love them SO much and we sure love Colorado too. In Colorado everyone loves their dogs like kids and loves the outdoors, we could fit right in. Be sure to check out our other pictures in our new photo album here. Or just click the link for our secondary photo album from the list on the left. I totally want to go to this festival and the pics of yellowstone are gorgeous!